Li rinmin nou, sé si! 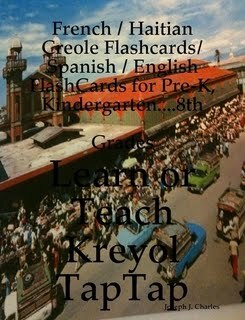 Purchase your copy of the Haitian Creole Flashcards here. New Chants D’Espérance Hymns EBook & Lyrics: Soaring on Wings Like Eagles is a collection of poems and chants inspired by the Christian faith. It has poems that will encourage Haitians and the rest of the international community in their efforts to find a lasting solution to the Haitian problems caused by the Jan. 12, 2010 quake. It tells you from which sources Haitians find comfort in these difficult times. This way, you can better appreciate Haitians’ resilience, faith and dedication. This new book can be sub-titled, “Haitian Writings for Hard Times.” All the lyrical poems were written in English. Get an automatic discount when you use Paypal!